Nigeria, on Friday, was formally presented with the 2013 Emerging Market Europe and Africa best sovereign bond award by City Bank group following the country’s successful issuing and over-subscription for the $1 billion Eurobond last year to finance infrastructure in the country. The $1 billion, with the allocation proceeds of 90 per cent going to power infrastructure financing and the balance to aviation projects, was specifically designed to improve power supply and partly bridge aviation sector infrastructure funding gap. 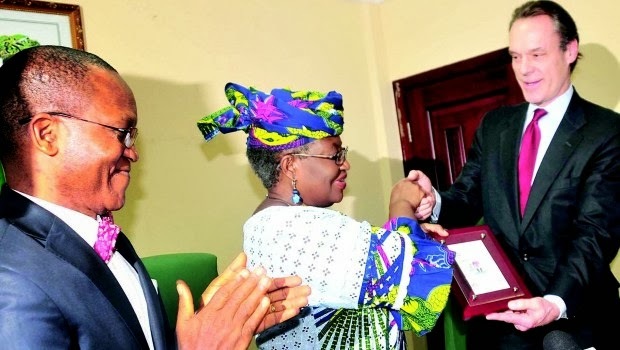 While presenting the award the Coordinating Minister for the Economy and Minster of finance, Dr, Ngozi Okonjo-Iweala, yesterday in Abuja, the Chief Executive Officer, (Europe, Middle East and Africa) of City Bank group, Jim Cowles, said the choice of Nigeria for the coveted award, was informed by Nigeria’s bracing the odds and volatility prevailing at the global market at the time and making huge success of the exercise. In her remarks, Okonjo- Iweala described the award as the reward for hard work and due diligence of the management of the Debt Management Office (DMO).